The Wizards got out to a fast start in the first quarter as they jumped out to a 18-4 lead over the Raptors. Markieff Morris put up 7 and Bradley Beal scored 6. Toronto picked up the pace during the last 6 minutes of the quarter as DeMar DeRozan dropped 8 points. The Raptors trailed 19-27 after one. Toronto went off in the quarter as nine different Raptors scored in the quarter. The Raptors outscored the Wizards by 12 points in the quarter. With 4:01 remaining in the half, Jonas Valanciunas got Washington's Marcin Gortat jumping on a pump fake and was able to drive past him. JV posterized Gortat with a monstrous slam-dunk that electrified the Toronto sideline. Toronto led the Wizards 51-47 heading into halftime. Toronto and Washington went back and forth throughout the 3rd quarter. The Raptors was led by DeRozan's 6 points. Valanciunas and Kyle Lowry combined for 9 points. At the 10:28 mark in the quarter, DeRozan juked out his defender and threw down a baseline slam over Gortat. Toronto had problems guarding Washington's Otto Porter Jr. during the quarter, allowing him to score 13 points. C.J. Miles scored 6 points within the last minute of the quarter for the Raptors. Toronto led 77-74 heading into the final period. Miles continued to have the hot hand going into the 4th quarter. He dropped a total of 11 points to ice the game for the Raptors. DeRozan and Fred VanVleet both scored 5 points to seal the game. With OG Anunoby out of tonight's game, Norman Powell started in his place at Small Forward. Powell failed to score any points, but he did a better than average job of guarding Bradley Beal. 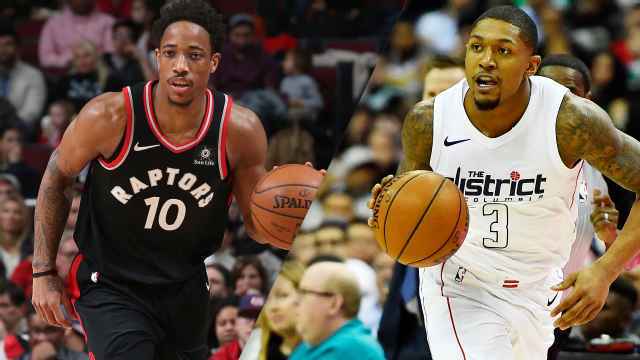 The Toronto Raptors defeated the Washington Wizards 102-95.